Product prices and availability are accurate as of 2019-04-25 06:56:50 EDT and are subject to change. Any price and availability information displayed on http://www.amazon.com/ at the time of purchase will apply to the purchase of this product. Are You Tired Of Generating More Plastic Waste Every Time You Shop? RYBit Is Your Solution You Can Feel Good About! 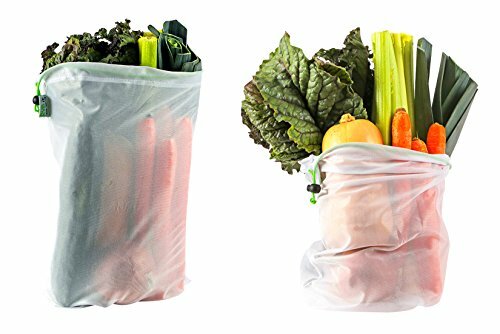 - Strong, durable yet flexible, our produce bag sets are designed to carry and store produce and a lot more! - 3 sizes (small, medium and large) to comfortably fit a long size veggie or a handful of trail mix and anything in between. 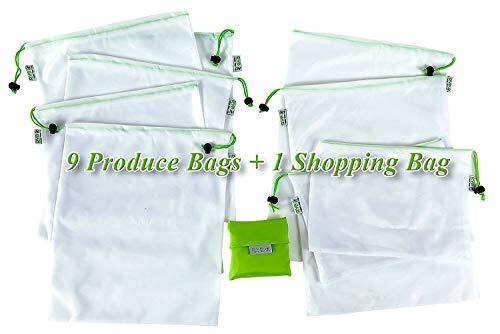 - Easy to clean, the reusable food bags dry super fast and can last you a longtime for many reuses. - Multi-purpose function. Use our reusable storage bags also as vegetable bags, beach bags, toy bags, laundry bags, sports equipment bags or hobby supplies. 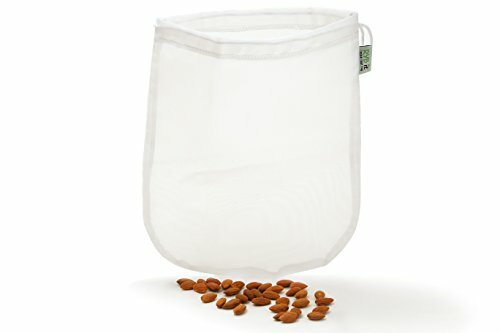 - Extend the life of your produce by allowing it to "breathe" instead of sweating inside the plastic bags. 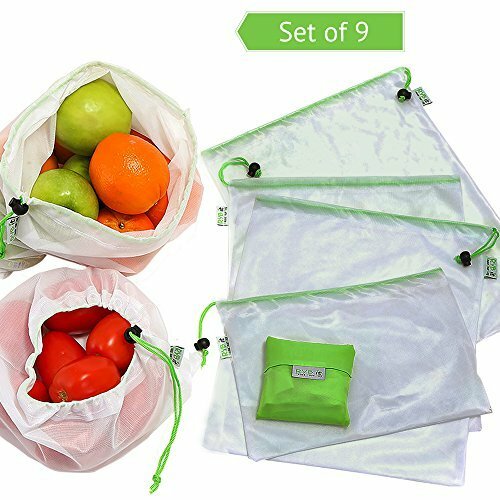 - INCLUDED in the set of your 9 mesh bags is a Food Grade Nutmilk Bag and a Foldable Shopping Bag making it a really Amazing Deal. SATISFACTION GUARANTEED! - We offer a *Money Back Guarantee* so you can buy with peace of mind. If you're not 100% satisfied, you get your money back, no questions asked. Try them out and experience the difference! Join Our Go Plastic Free Movement and ORDER NOW! PERFECT FOR SHOPPING AND STORING PRODUCE - Very convenient and sturdy our 9 bags set comes in 3 sizes: two large 12x17", five medium 12x14", two small 12x8" along with our FREE Gift, a foldable shopping bag. Whether it's a long stalk of celery, 5 pounds of potatoes, small size coffee beans or rice, RYBit bags will hold it all. The breathable, see through material can even extend the life of your greens by keeping it fresh longer in the fridge. And that means less food waste and more money. PLASTIC FREE IS THE BEST WAY TO BE - Are you feeling concerned about all these single use produce plastic bags ending up in the garbage and ultimately in our landfills or oceans? Now You can Be Part of The Solution and Go Green with our RYBit bags! Using our eco-friendly grocery bags will make you feel so much better knowing you significantly reduced your footprint. They are easy to clean and machine washable ready to be reused. MULTI - FUNCTIONAL - One bag for many uses and not limited to food shopping! Use these different size bags to carry or hold many different household items from knitting tools to Christmas deco. And of course you can use them for school snacks, little toys, books, office supplies, laundry delicates, cosmetics, shoes, gym clothes or small sports equipment as well as for travel or camping trips. You will enjoy having these lightweight drawstring bags in your everyday life! FREE BONUS GIFT - Included with your RYBit Reuse Your Bag set is a foldable shopping bag in a little pouch. It's super light and small when folded so you can easily carry it with you in your purse or handbag at all time so you have it handy when needed. JOIN OUR FAMILY OF EARTH LOVERS - With your decision to join us in going plastic free while grocery shopping you are taking an important step in making a difference for our planet! It will potentially save many hundreds of plastic bags per year. We are confident you will enjoy our bags but if for any reason you are not entirely happy we'll get you a refund or replacement within 30 days no questions asked! Make your pledge to go Plastic Free and Order your RYBit Set today!